It is clear that cloud computing has the potential for the BAS to seamlessly integrate with other business services to provide a user friendly, cost effective and in depth solution to the client, transparent of the underlining technology. Cloud computing has the potential to be the next major driver of business innovation across all industries allowing more dynamic, resilient and cost effective information technology systems to organizations. Over the last few years the concept of cloud computing has gain widespread of interest in research institutions and businesses to debate the implications to formulate a path to use the technology as a business enabler to gain competitive advantages for organizations. However, as with any technology it is difficult to distinct the reality from the hype to form a clear strategy to capitalize on the technology. Just as many industries became a winner with high rewards with the dot com boom, there were many failures. Cloud computing will have a similar impact in the market place and it is up to the industry to define a winning strategy to successfully adopt the technology. The building automation industry has generally been a slow player when adopting new technology. Over decade ago, majority of building automation systems were proprietary and the BAS was another tool required for operation of a building. A facility manager reacts to the system when in fault but system was non-existent to the outside world. However, over the decade emergence of open system protocols such as BACnet and LonWorks and worldwide emphasis on energy management and sustainability, the rate of adoption of new technology and rate of continual improvement by BMS vendors has increased dramatically. Most vendors are using web technology and open system architecture to integrate and converge with IT networks to create new features at a more cost effective and time efficient manner. As the cloud computing wave hits the market, it is up to the IT executives of the building management system vendors to adopt the technology into BAS with a clear strategy. The paper analyses the basic concepts of cloud computing, the implications it has n the BAS value chain in manufactures, system integrators and end user and an example to outline the operation of cloud in the BAS market. Cloud computing is the term used to describe the use of interconnected business applications over the Internet. As depicted in figure 1, the applications are interconnected via web services and the end user accesses the required service using a web browser. Therefore the application and the infrastructure does not reside in end users premises. The end user accesses the application on demand and can concentrate on using the application for its purpose, without investing in capital expenditure and avoiding the overhead of installation, networking and maintenance. 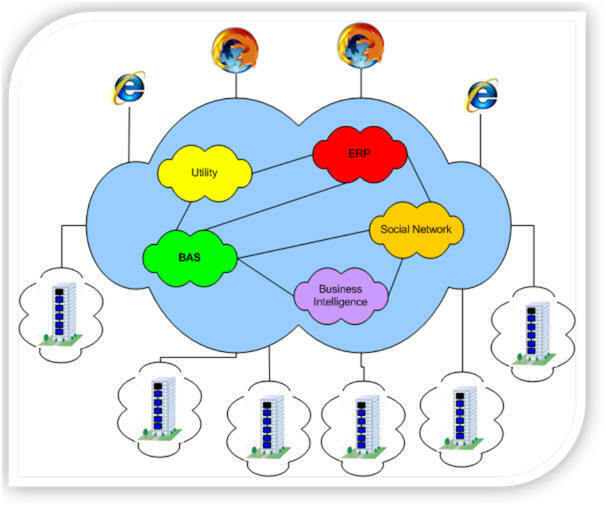 Figure 1: Set of interconnected business services/applications via web services, communicating with each other is available as a web service or via web browser over the internet for the end user. Each service or cloud consists of detail architecture and technology invisible to the end user. It consists of the application/service, platform, infrastructure and storage. 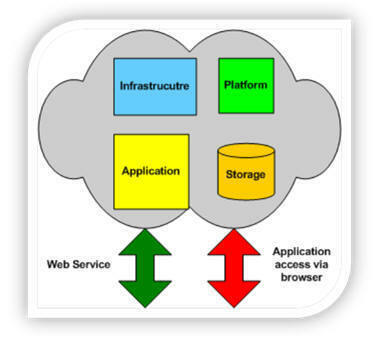 Application/Web Service: Delivers the software/application as a service (SaaS) to end user or other clouds. For example the end user in BAS can access the user interface for control networks and it can have services for other parties obtain data from BAS. Infrastructure: Computer infrastructure usually in platform virtualization environment as a service. Storage: Consists of the database to read and write data. The early modeling of the cloud computing concept has various deployment methods in public, private and hybrid clouds. A public cloud service is available over the Internet via direct application or web service to the end user. A private cloud is restricted to private networks for data security and reliability. A hybrid cloud consists of multiple private and/or public clouds to provide enterprise solution. Which deployment model will the building automation market fit into? The vision of smart grid where the BAS communicates with other industries and the need of having a secure control network clearly indicate that BAS market will adopt a hybrid model. 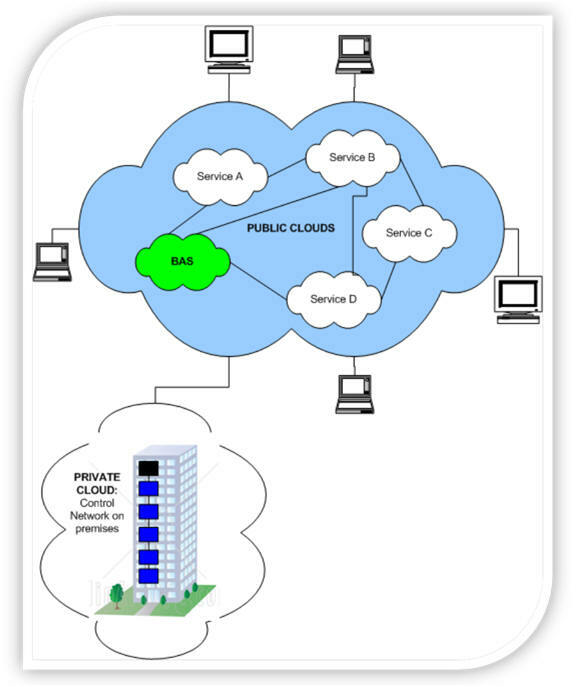 As it is depicted in the figure 3, the general cloud computing architecture for BAS includes the building management software residing in a public cloud interacting with the other clouds and the control network itself is in a private cloud in a building. Obviously the controls itself cannot be moved away from the premises and the control networks should be restricted to the stakeholders of the building. Therefore a hybrid cloud models the BAS market space. What is the implication of the hybrid cloud computing model to the BAS value chain in manufacturers, system integrators and end users? The cloud computing concept must be driven by the BAS manufacturers. The manufacturers must begin to transform their current software applications into a fully web enabled architecture. The implication for the manufacturers is the investment in the R&D process to transform their existing products into a fully web enabled model. However, at present as most BAS vendors have some presence of web technology in their product range, the processes of transformation can be phased into manageable components. Latest web technology such as AJAX and Adobe Air can assist the developers in tackling common web issues such as speed and appearance. Also, the manufacturers need to open up their software via web services to integrate with other clouds in the network and extend features such as enabling platforms for users to further enhance the system to meet their requirements. One key challenge of exposing application program interface to external users is security. At present most BAS vendors has basic security features implemented in their systems. As the manufacturers transform into the web and cloud computing model, high investment must be allocated in developing data encryption layers for the application. Also, more robust solutions must be implemented as the application delivery architecture is a one-to-many model (single instance, multitenant architecture). This includes data backup and server switching on failure procedures. The primary benefit of cloud computing for the manufacturers is the ability to integrate with other businesses in the same or different industries to form business partnerships to form new business models to improve their competitive advantage. The system integrators benefits from cloud computing from cost reduction in application support and more opportunity to integrate with other business services to provide turnkey solutions to the end customer. As the software is severed as a service (SaaS) to the end customer, less instances of the application is installed allowing the integrators to manage and support it from a single point of control. The integrators can use the platform as a service (PaaS) to further enhance the existing functionality of the software and integrate with other business services. The implication to system integrators includes space requirement to manage servers as it is moved away from the end customer and to have robust networks to support multi tenant architecture. The integrators have the opportunity to maximize server usage by virtualizing it to maximize the throughput. At present if one server is installed per site, the server is not used to its capacity. In a cloud environment, the physical server can be virtualized to run multiple clients from one server. The Cloud computing architecture also creates more complexity to managing networks and integration, which requires system integrators to better educate their support staff to manage the issues. The cloud concept can be an immerse change to support staff who has been in BAS support role for many years. Over ten years ago, BAS had a simple dedicated network and some cases just stand alone devices. Therefore troubleshooting was independent of each device and simple. As BAS converges with the IT networks, web and cloud model integrating with many other applications, it is very important for the integrators to continually educate the support staff to avoid backlash of the technology to evolve the cloud concept in the BAS market. The system integrators also require changes to their pricing models as the software and infrastructure is provided as a service to the end customer. The customer pays a subscription fee for the service rather than purchasing licenses. Therefore the integrators require remodeling of pricing structure and negotiate new service level agreements (SLA) to maximize their return. The primary beneficiary of cloud computing architecture is the end customer. The facility managers can devote more time to enhancing the value of using the BAS by managing onsite mechanical and electrical assets and less on day to day challenges of networks and servers. The technology behind cloud computing is transparent to the user, making the cloud computing incredibly user friendly. The cloud concept greatly benefit multi-building/multi-national sites situated globally such as universities, department stores, fast food outlet chains, banks and hotels as few examples. In current situation, such sites have multiple servers taking up real-estate and databases with duplicate and redundant data. In a cloud environment, it can operate in one application instance and database accessed via the web browser from anywhere in the world. This yields significant cost savings in real estate, which translates into reduction in energy consumption for power and cooling costs of servers. The facility manager has access to global view of data collected from the control networks, which translates to better decision making process to improve issues such as energy management and carbon foot reduction. Also, as the capacity of the valid data increases, more opportunities arise to use the data as intelligence for BAS to provide proactive solutions to the challenges of managing a building. At present to meet such requirement the control networks is installed at each branch and at each location a server running the software with a database to monitor and control. Therefore it requires 100 plus servers, requiring a large investment in capital. For reporting requirements specialized software needs to written to merge the databases and link with the ERP system to allocate costs. It is difficult to proactively manage the KPIs as system can struggle to obtain the required data at the right time. The current systems have great difficulty to meet such requirements in efficient and cost effective manner. 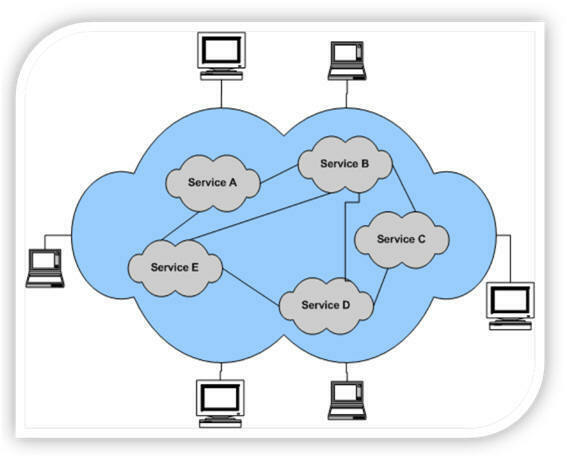 Figure 4: BAS connectivity to the cloud. The BAS is interfacing with business intelligence software, which generates custom reports required for executive, management and user levels. The data obtain from the BAS via control networks for each branch is linked to the intelligence software via web service to generate the reports. As more data is gathered by the intelligence software, it performance data mining to proactively report actions required to meet the key performance indicators. The facility managers can compare different branches performance and set benchmarks to improve on KPIs. The users access the end result of above integration using simple web browser. From the simple example it is clear that cloud computing has the potential for the BAS to seamlessly integrate with other business services to provide a user friendly, cost effective and in depth solution to the client transparent of the underlining technology. The cloud computing model benefits BAS manufactures, system integrators and end customers to streamline their current business models and open up new ventures. However, the BAS industry must be proactive in developing strategies to manage the model change and not fall behind other industries during the transition period.